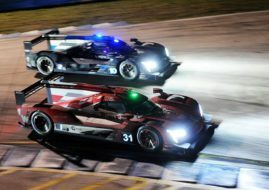 After winning the 24 Hours of Daytona, Wayne Taylor Racing‘s Cadillac triumphed in the 65th edition of 12 Hours of Sebring. It was another fine race for the Konica-Minolta sponsored team but also for Cadillac after scoring 1-2-3 finish. Alex Lynn, Ricky Taylor and Jordan Taylor won the race in front of Action Express Racing’s car #5 of Filipe Albuquerque, Christian Fittipaldi, and Joao Barbosa. The second Action Express Racing’s car #31 with Dane Cameron, Mike Conway, and Eric Curran as drivers, finished third in the American classic race. The GTLM class battle was quite interesting after the pole-sitting Chip Ganassi Racing’s Ford GT of Ryan Briscoe, Scott Dixon, and Richard Westbrook started at the rear of the field after mechanical issues on the grid while at the end Corvette Racing’s car #3 (Jan Magnussen, Antonio Garcia, Mike Rockenfeller) won the race what was the 3rd consecutive win for the team at Sebring. In the PC class the winning team, just like at Daytona, is Performance Tech Motorsports with drivers James French, Kyle Masson, and Patricio O’Ward. Finally, the GTD class winning team is Riley Motorsports with Jeroen Bleekemolen, Ben Keating, and Mario Farnbacher in the seat of #33 Mercedes-AMG GT3.